An amendment to CITES Appendix II in January this year is resulting in the biggest forced change in guitar manufacturing ever. So what’s the big deal with rosewood? It’s perhaps the most revered of all tonewood species and it’s used extensively in guitar manufacturing. You’ll find it under your fretting fingers on a great many Gibson, Fender and Martin models, not to mention the countless brands they’ve inspired along the way. Backs and sides of premium acoustic guitars, bridges, headstock overlays, binding, tuning pegs, bridge pins, control knobs, even whole necks and bodies in a handful of instances. Make no mistake: rosewood is a big deal in the guitar world. However, in May 2017, Fender - the biggest guitar maker in North America - announced it would no longer be using rosewood fingerboards on its Mexican-made instruments. Pao Ferro is to be the replacement, while ebony steps in for its American Elite Series ’boards. Other manufacturers are following suit - or indeed were ahead of the curve in finding alternatives to rosewood - and it’s all down to extra legislation regarding the timber’s import and export. CITES is the Convention on International Trade in Endangered Species of Wild Flora and Fauna. CITES is a voluntary international agreement between governments. Its aim is to ensure that international trade in specimens of wild animals and plants does not threaten their survival. CITES governs things including ivory, rhinoceros, tigers, honey badgers, fur seals, civets, linsangs, armoured catfishes, Himalayan yew, natal ginger and, of course, our beloved dalbergia. The list runs to more than 35,000 species in total that are split into three Appendices based on the level of severity of their, erm, endangeredness. There are some 900-ish species on Appendix I, about 34,000 on Appendix II and 150 or so on Appendix III. There are currently 183 Parties (countries or groups of countries/territories) within CITES including the USA, the UK and most of the rest of the world, though not all are fully ratified. There’s much more information at www.cites.org for anyone who would like more detail on the organisation’s activities. So far so boring, but the interesting bit comes when we say that CITES is legally binding for its Parties, but does not supersede or replace national legislation. That means that legislation is enforced by different departments and with different levels of severity from country to country, even from province to province. That inconsistency in administration and enforcement is what’s giving the guitar industry such a monumental headache in 2017. Make that a migraine. A relevant example of national legislation is the USA’s Lacey Act of 1900. It was initially introduced in the US as a measure against the illegal hunting and subsequent trade of poached animals across State lines and is separate from CITES. Various Amendments over the years have increased its scope to include the import and trade of plant and fish species, including the 2008 Lacey Act Amendment that changed the way American companies had to account for their tonewood imports and usage, notably all rosewoods and ebony. In short, it shifted responsibility for the timber’s legal provenance on to the guitar companies themselves. Gibson was a casualty of the 2008 Amendment, fined $300,000 for violating the Lacey Act. The most recent CITES changes came into effect on 2 January 2017, putting all rosewood, bubinga and kosso on Appendix II of its protected species list, as explained earlier in this piece. 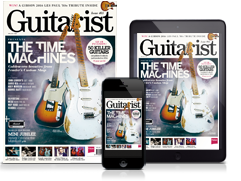 Since the first version of this article ran in the Spring 2017 edition of Guitarist Presents Acoustic, we’ve continued speaking with a number of manufacturers, distributors and retailers. The teething troubles have passed for some, turned into serious toothache for others, and full-on extraction for others still, if you’ll forgive the analogy. One source quipped that Felixstowe docks were currently the biggest guitar warehouse in the world due to the container loads of instruments held up due to rosewood import/export issues. It seems that while CITES felt rosewood’s situation critical enough to move it to Appendix II and require significant extra paperwork, the infrastructure in the national and regional departments responsible for dealing with it simply wasn’t there. The result is significant backlogs and serious delays in shipment processing due to under-capacity in dealing with the paperwork. That’s frustrating if a big proportion of your sales revenue is sat in a container on a dockside and there’s absolutely nothing you can do about it. Nevertheless, despite those very real issues, the situation is now clear in terms of requirements and processes. The onus is very much on importers and exporters, not on individual guitar owners, so now is a good time to assure you that nobody is going to come after you for a guitar using Indian rosewood. Individual guitar owners are also free to travel with personal instruments using Appendix II-listed rosewood. If anybody (guitar makers, for example) has a stockpile of those species’ imported before 2 January 2017, they must apply for pre-Convention certification. Most manufacturers are now on the case with this, via the relevant authorities in their respective countries. All of which means that, as it stands, your East Indian rosewood [dalbergia latifolia] Martin HD-28, for example, is absolutely fine to own and use. You can travel freely with it wherever you like as long as it doesn’t contain over 10kg of rosewood: unlikely. Buying and selling is fine within your own country, but if you want to export it - to America, for example, or indeed buy a guitar from America to import to the EU - that now requires certification. Let’s say that more clearly: importing ANY guitar that uses rosewood to the UK from outside of the EU is illegal without the proper export and import licence. Further, if you’re buying a higher-end guitar, it might be that you have paperwork all the way down to the serial number of that particular instrument. It is certifying that the protected species used in its construction have been legally sourced, processed, imported and exported right from the tree to the fingerboard, for example. Did somebody say Brexit? Current legislation covers the EU as a whole, so the EU is the import/export region. Fender, for example, can import and sell its instruments within the EU under one set of paperwork. Should the UK not negotiate a deal otherwise during Brexit, all that import/export paperwork (and associated cost) will have to be duplicated for trade to and from the UK from EU nations for guitars using rosewood. In that event, you can expect to see more guitar companies moving operations out of the UK if they have significant EU business. It’s important to understand that Brazilian rosewood (see below) remains a separate case and is still covered by the more stringent legislation associated with Appendix I of the CITES protected species list. Guitar enthusiasts may be partly justified in feeling scapegoated for the ravages of the illegal timber trade, maybe even the legitimate use for ‘lesser’ products such as furniture and construction, but the effects of rainforest/ecosystem destruction and rare species depletion are there for all to see. We must not ignore it, which brings forward two conversations: the first is around regulation already discussed in this piece; the second is about the wider use of sustainable and alternative materials. And if you want to set a guitar forum or comments section alight online, ask a question about Martin’s or Gibson’s use of Richlite fingerboards. You’ll get everything from people arguing passionately that it sounds measurably ‘worse’ than ebony or rosewood, to claims that the guitar companies are wilfully and deliberately ripping off their customers by using ‘lesser’ materials. The irony of the latter is that alternative materials can often be more expensive to develop and use. Despite the best efforts of Martin, Taylor and Gibson in pushing the likes of Richlite and HPL for more than two decades now, many guitar enthusiasts - particularly fans of premium instruments - remain uninterested in anything but traditional timbers. An optimistic view of the medium/longterm future would be that increased legislation leads to a significant decline in the illegal wood trade, not to mention an increase in price of legitimate supplies, making it uneconomic for high-volume use. That would leave the - many say plentiful - remaining supplies of premium hardwoods for well-regulated, managed and sustainable use. That would be good for the local economies of the timbers’ origins, enabling greater prosperity and better infrastructure on some level in those parts of India, Indonesia, Africa, South America and so on where these timbers can become even more precious and valuable resources. Ergo, if things are correctly managed, we can have new rosewood fingerboards and indeed traditionally spec’d Martin D-28s for a good while yet. The more pessimistic view, however, may be to cite ivory as the reluctant and tragic poster boy for endangered species: the only way to regulate it is with a total ban on its use. For now, don’t panic about your existing rosewood guitar. The headache currently furrows the brows of the manufacturers and retailers as long as the species remain on Appendix II. Expect to see a lot of weird and wonderful fingerboard choices for a while, alongside every brand flagging up rosewood as a premium option. It’s gearing up to be a fascinating few years. The fabled Dalbergia nigra (Brazilian rosewood) stands apart from the majority of other rosewood species as it’s been on CITES Appendix I since June 1992 (all other rosewoods are on Appendix II as of 2 January 2017). 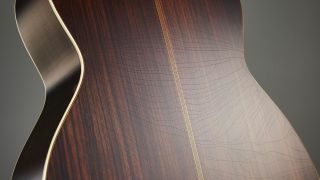 Brazilian rosewood was used freely in guitar manufacturing until the late 60s - on vintage Fender and Gibson fingerboards among many others and, of course, used as backs and sides on a great many of the most desirable, classic-era acoustic guitars, not least all the most valuable Martins. Any wood used before 11 June 1992 is considered to be ‘pre-Convention’ (and therefore ostensibly free to use), but hold your horses… There are further Annexes to the CITES Appendices. Brazilian rosewood is on Annex A: any pre-Convention specimens may not be imported to various territories (including the EU) for commercial purposes. There are exemptions for specimens acquired before 1 March 1947, but importing any items containing Brazilian rosewood into the EU requires a permit by the CITES Management Authority of the importing country. So if you’ve bought/sold a guitar or travelled with one with any Brazilian rosewood after 11 June 1992, and you don’t have the relevant authorisation/paperwork, that trade or travel was technically illegal. Don’t believe us? German customs authorities began an investigation into the import of 460 electric guitars with Brazilian rosewood ’boards in 2011/’12. It led to the confiscation of some instruments, including two PRS guitars with Brazilian rosewood ’boards advertised for sale on eBay in 2012. Since then, the idea of a ‘guitar passport/ exemption for travel’ has gained a great deal of ground. Did the 2017 CITES legislation take you by surprise? Were there measures in place to help you deal with it, in terms of paperwork, process and so on? “This is where it gets really difficult. Any commercial transaction involving rosewood now requires an import and export licence. The exporter, Martin, for example, must obtain an export licence and the importer must obtain an import licence, that would be Martin’s UK distributor, Westside. “However, you can’t apply for the import licence unless you have the export licence. When you add all that up, it can add four to six weeks to the whole thing. Plus there’s the cost: as I understand it, the cost of the import licence to the EU is £74. That might apply to a whole container of 500 guitars or a single instrument. If we assume that’s a similar value on the US side, it can add a lot of money to the cost of small shipments. How does it affect a big instrument retail business such as Andertons? “We’ve seen big delays in shipments and deliveries. That might be because the exporters/importers don’t know who to talk to, or they might be completely on it, but it’s still taking time. And changes to product ranges are already happening. Taylor stopped using rosewood completely on the 100 and 200 Series as a direct result; Reverend and Chapman have stopped using rosewood, as has Fender on its Mexican-made guitars. That’s a big deal! “What I find staggering about the whole thing is, how will it be policed? The customs person sees brown wood on a fingerboard - do they start chipping it off and analysing it? The enforcement will vary hugely across the world, the great irony being that the amount of rosewood used by the guitar industry is tiny compared with other uses such as furniture. But we have to be pragmatic and we absolutely support the preservation of endangered species. Did the new CITES legislation take you by surprise? “I talked to DEFRA [UK Department For Environment, Food & Rural Affairs] right away and they pointed me at Form FED0172, which is the standard application form for permits to import CITES-listed flora and fauna into the EU. Part of the form requires presentation of the export permit from the supplier company - Collings, in our case - so we have been dependent on the US Fish And Wildlife Service, the CITES management authority in the US, for the relevant export permit, which we received in the second week of February. How does it affect business and product offering for a low-volume, high-quality brand such as Collings in Europe? “I’ve been in this business a long time and there’s not much evidence to suggest that serious guitar players and enthusiasts will accept alternative materials any time soon! It’s likely that premium guitars will become even more so as the classic hardwoods disappear from mid-price instruments. On a less speculative point, the new rules do add £74 to the import cost of each shipment of guitars, plus extra admin. It’s not a big deal for decent-sized shipments.